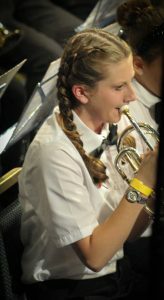 The Youth Band attended the South W est Brass Band Association Championships held at Torquay on Saturday November 5th. Well they certainly set off a few musical fireworks!! This had been the first out off county “bus trip” contest for the Youth Band since it was reformed in 2010 and the young musicians, ranging in ages from 6 to 15 were certainly excited to say the least!! Some of the under 20’s from the Senior Band also played with them to lend a bit of experience along with the allowed 2 adult players Luke Bazeley on BBb Bass and Colin Whitford on Bass Trombone. They played an “own choice” test piece “English Folk Songs Suite” by Ralph Vaughn Williams and arranged by Frank Wright. There was some truly fantastic playing by the young players, and the outstanding performance earned them an excellent 2nd place, just being pipped by the youngsters of St. Keverne. However, our Youth Band’s Principal Cornet, Holly Sargent, came away with the best instrumentalist prize for the second contest in a row this year!! Some maid!! Not only did they play well but their conduct and behavior was absolutely exemplary, they are a credit to St. Dennis and we are so very proud of them and their trainer Rachael Sargent. We would also like to thank all of the parent helpers, tutors and committee members who worked hard to make the day run so smoothly.